Platinum mobile reversible boards from Best-Rite. 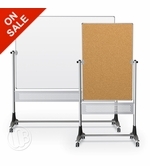 Versatile, double sided mobile boards allow you to get up to twice the functional space of a wall-mounted board and the fact that they're portable lets you use them in more than one space. You can't do that with wall mounted boards. Surface Options! 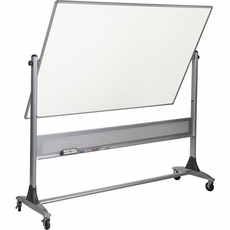 Available in a variety of surface combinations, including a porcelain steel magnetic dry erase, Dura-Rite™ a Dura-Rite®: HPL non-magnetic dry erase writing surface, natural cork tack surfaces or a combination of both dry erase writing surface along with a natural tan cork tack surface. Reversible! The panel is trimmed with modern anodized aluminum. Each panel rotates 360° on a pivot hinge and locks into place with the turn of a knob. 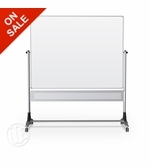 Each unit includes a full-length accessory tray with perforated panel for style and stability. The right size! Available with three surface sizes of 40"H x 30"W, 4'H x 6'W, or 4'H x 8'W. Smallest size ships UPS to save you time and money. The wide base design allows for stability includes molded bumpers to protect walls and there are 3" locking casters for ease of mobility. 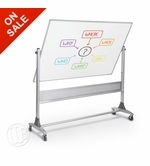 Porcelain Steel Magnetic Dry Erase Surface. 50 Year Warranty! We're a Yahoo Five Star Store and we have received Yahoo Pro-Seller and Top Destination Store Awards. You can put your trust in us.